Cooking with Calphalon 10 Pc. Hard Anodized Cookware Set just $128 Shipped or Less! Kohl’s has the Cooking with Calphalon 10-pc. Hard-Anodized Cookware Set for just $127.99 + Free Shipping + $20 Kohl’s Cash when you follow the checkout instructions below! No Kohl’s Card is needed! 1. 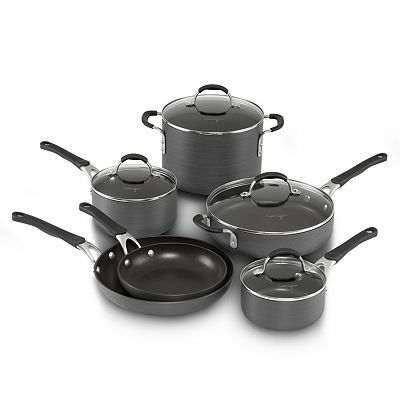 Add Cooking with Calphalon 10pc Hard Anodized Cookware Set to your cart. Price will drop from $199.99 to $159.99 once added. 3. Your total will be just $127.99 + Free Shipping + you’ll score $20 in Kohl’s Cash! For Kohl’s Card Holders: If you currently have a Kohl’s credit card, you can use 30% off coupon code: SHOPNSAVE for a final price of just $111.99. HOT: Pack of 29, Size 3 Huggies Jeans Little Movers Diapers just $2.99! Lowe’s Giving Away FREE Tree’s on April 23rd! Fisher Price Fun 2 Learn Computer Cool School just $39.97!